There is more to a creating a home than splurging on everything new and trendy, the truth is that a glossy magazine spread not as engaging as your own real life personality. A home is an expression of who you are and how you live and all things that have and will happen. How do you let your personality to come to the fore? There are tricks of the trade, indeed. You need will to “Master Your Mix”. Which simply put, means you need to mix it up. Playing with things like shape, balance, textures, scale and contrast in every room. Suppose you have a vintage mahogany bombay chest handed down to you from your Great Aunt? Then you add a large piece of colorful contemporary art, from your roommate in college, above it , pull a color from it and continue it with accents throughout the room. Consider adding a wood frame chair in the same accent color and set beside it is a sleeker table that contrasts between the lines of the two. Lastly, on the chest place your favorite box that hides clutter. 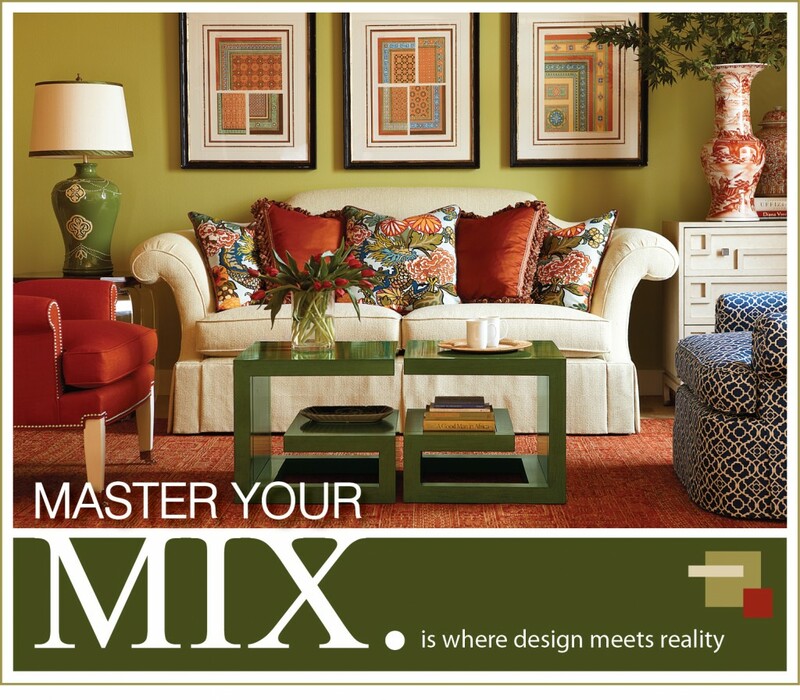 Our team of designers have created a some suggestions on how you can have a more spirited home and master your mix! Ok, so you love contemporary AND the dining table you from your Grammy. Bold graphic prints will master the mix like a blender! Seriously though, confident graphics in a wallpaper or smaller repeats on your China….mmmmm beautiful. Risk are for those who love reward! 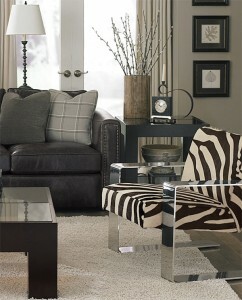 Against a neutral, a hit of vibrant color is not overpowering- it conveys a tailored and smart look. Colour. You don’t realize how it fills the senses to live with color. Whatever you want to emphasize, whether contrast in color or bold graphics or counting the layer of monochromatic colors your rug will be one of your main opportunities to confirm the direction you desire. Your rug will add visual warmth, delineate your space, adds depth and either channels your eye to a focal point or adds contrasting value to emphasize the small details of the room. Create harmony with good paint choices. Colors should always support continuity, and bring rooms together with adjoining painted walls. An average sized house should only use a maximum of 5 colors or 3-4 per floor. Enhance the beauty of your home with specialty pieces. Glass knobs and hardware, trim and mouldings are great structural accent pieces that are appealing and appreciated to the detailed eye. Try to maintain one staple color throughout your home either in an accessory, case goods, painted wall, and/or drapery. Harmony and balance are essential for esthetics and design. Combine larger objects with smaller ones to bring depth and dimension to a flat surface like a console or bookcase. Use odd numbers which are more pleasing to the eye when creating the vignette. Texture variations bring visual interest to the room. Consider ceramics, glassware, smooth metals, shag carpets and sleek leather for a modern look. Books, wood tactile textiles, sumptuous leathers and hand woven area carpets for a traditional feeling. Make your draperies enhance the furniture, area carpets, artwork and architectural details by pulling related color or pattern that to tie the look together. Sofas, chairs, beds, tables, lamps, chandeliers: These are the pieces that make a statement in a room. Just by varying the color, texture, and scale creates a layered, interesting look that’s truly yours. Juxtapose styles. Try combining a modern live edge table with traditional upholstered chairs. Combining old and new can create homey, lived in feeling. When pairing a number of styles and/or patterns stick to a rigid color palate in order to create a unified look. Creating a home office entirely of white can be soothing and relaxing place to be creative. Unexpected color and one or two hits of it. It can be done with furniture for example with a lime green chair from LEE or custom painted side table though CTH Benjamin Moore Program.